Francine's Friends: Francine's Friends Press Conference Announces "$50k in 50 Days!" Francine's Friends Press Conference Announces "$50k in 50 Days!" 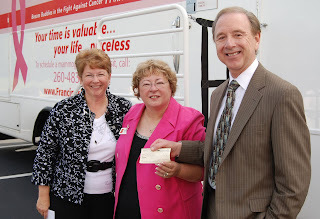 Francine’s Friends kicked off its grassroots capital campaign — “$50k in 50 Days!” and announced its plans to to purchase a new coach for the mobile mammography initiative. The press conference was held at Debrand Fine Chocolates, which is one of the many site locations the mobile mammography coach visits. All in attendance also received a FREE piece of chocolate from DeBrand - a sweet treat for all those present! 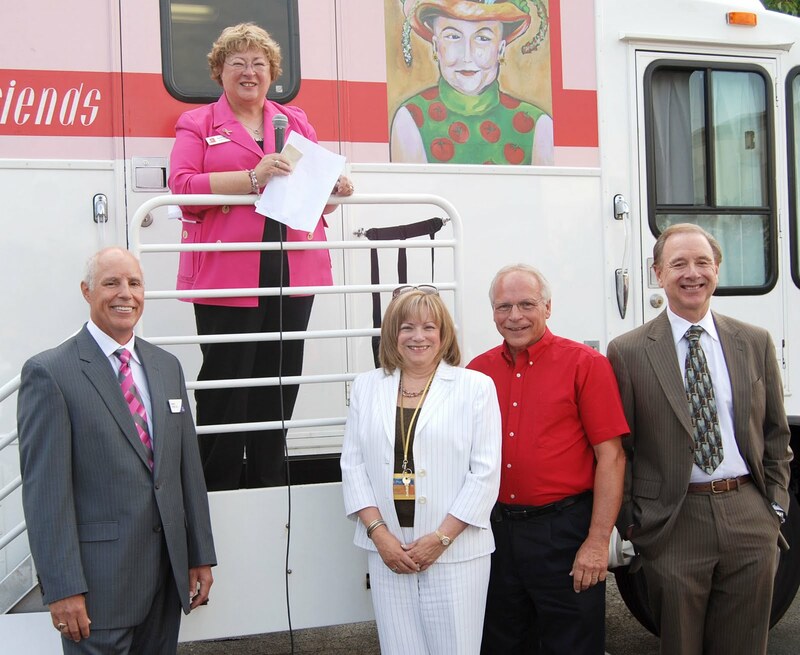 Francine’s Friends, an all-volunteer 501c3 nonprofit who founded the mobile mammography initiative and purchased the original coach, has committed to purchasing the new coach and has been quietly raising funds to do so. The original coach, built in 1989, was refurbished for Francine’s Friends, with digital state-of-the-art mammography added in 2006. Francine’s Friends, whose mission is to make early detection of breast cancer available to every woman in Fort Wayne and the surrounding counties, has provided screening mammography for over 16,000 women since its inception in 2005. Francine’s Friends board president Sharon Simmons shared updates about the “quiet phase” of the campaign and funding status, liking the funding to date as being “true to the spirit of our name sake, Francine Schubert, who always met challenges with enthusiasm and determination!” Campaign chair and friend Vicki Johnson of Tower Bank explained details about the final grassroots phase of the campaign — and the goal of “$50k in 50 Days!” to help reach the overall campaign goal of $350,000 — adding that along with workplace fund drives and donation collection sites locations around the community, persons may mail checks or donate online at FrancinesFriends.org. “You can donate $1, $5, $10 or any amount to help keep Francine’s Friends on the road and make life-saving screenings available to every woman, regardless of her ability to pay,” said Johnson. “Each and every donation adds up!” The “$50k in 50 Days!” campaign runs through October 1st. 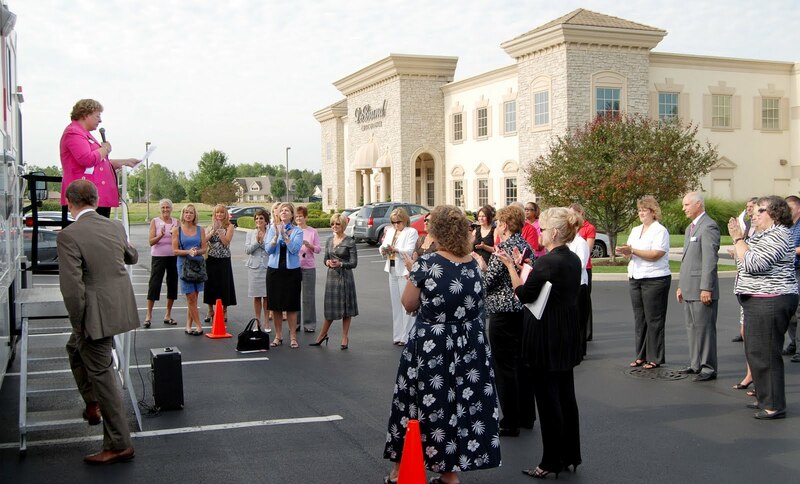 Major funders of the campaign to date include English, Bonter Mitchell Foundation, PHP Foundation, Radiation Oncology Associates, Indiana Surgical Specialists, Steel Dynamics Foundation, Mary Cross Tippmann Foundation, Wilson Family Foundation, Journal Gazette Foundation, Waterfield Foundation, and Howard P. Arnold Foundation. View more photos of the press conference here. View a video of the press conference by clicking here - thanks to Doug Ferguson of Neverends Productions (NeverEndsProductions.com) for creating and providing this video link. The mission of Francine’s Friends is to make early detection of breast cancer available to every woman in Fort Wayne and the surrounding counties. 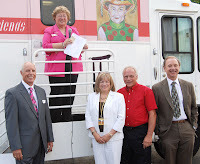 For more information, or to view the mobile mammography schedule, visit the website at FrancinesFriends.org. 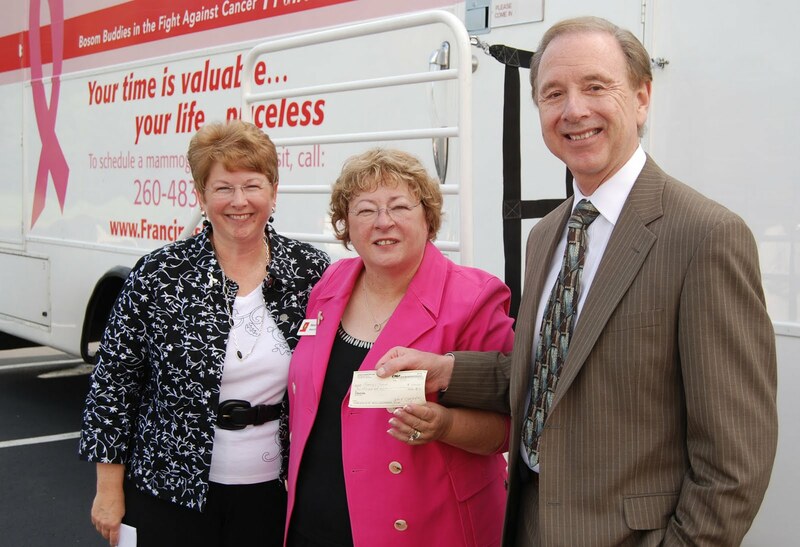 Dr. John Crawford (right) presents the first donation for $1,000 to Francine's Friends campaign chair Vicki Johnson (left) and Board President Sharon Simmons (center).